This is a book full of 90 devotionals written by a diverse group of women. Simple devotions to refocus your day. Each devotions begins with a scripture which leads into a personal story by the writer. A simple prayer and a time of reflection follow. The stories were interesting and not overly wordy. This is a nice book to just pick up and read in 5 mins to help refocus your busy mind in the middle of the day. Not a lot of depth and study involved with it. The stories are varied, some more emotional than others but geared to a wide range of women. 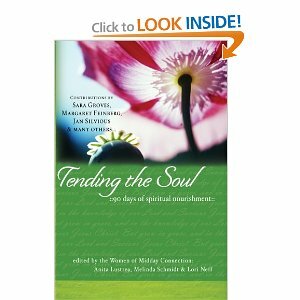 Tending the Soul is a nice addition to your daily devotions and Bible reading time. I received a copy of this book from Moody in exchange for an honest review.